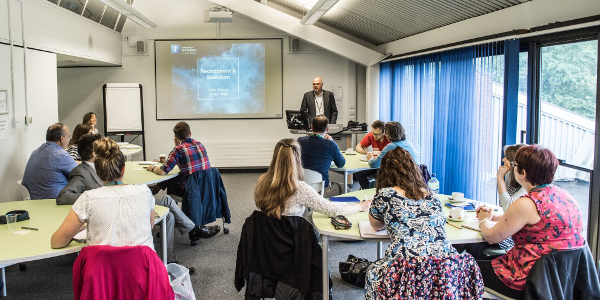 A set of colleagues have been nominated by each of the Faculty Pro Vice-Chancellors, the Director of Finance and the Registrar to help drive engagement across the University on the implementation of the new Campus Solutions student records system. These colleagues represent their Faculty or department and are actively inputting into the various planning activities for the implementation of the new system. They are responsible for voicing the needs and concerns of their Faculties and departments and raising them through the development of the implementation plan. In total, there are 78 colleagues that meet once a month in smaller groups known as the Campus Solutions User Groups. Seven meetings take place every month and are chaired by the respective Faculty Pro Vice-Chancellor or the head of department. Following these meetings, the chairs report back to Andy Long, Deputy Vice-Chancellor, in a senior User Group meeting. The User Groups recently took part in a demonstration of Campus Solutions where colleagues provided their feedback and questions on the way the system works. Further demonstrations and guest speakers are planned for future meetings. Campus Solutions demo roadshows have been scheduled for all colleagues from the end of October, where you will have the opportunity to see the new system for yourself. There are nominated User Group members in your area that can provide you with further updates on their meetings. Your local User Group contact person is given below – feel free to contact them with your questions and feedback regarding Campus Solutions.